Editor’s Note: We cannot say enough how honored we are to have recipe developer and food editor to some of best and brightest chefs in the world share exclusively with LatinoFoodie readers her pan dulce recipe. I had the opportunity to work with Rochelle Palermo during and after culinary school. At this point Rochelle has tested, written, and developed recipes for top-shelf cookbooks and magazines, including working with celebrity chefs. Her titles are as abundant as is her generosity. To learn more about Rochelle, go to http:rochellepalermo.com. Gracias por todo, Rochelle, for truly being an inspiration and dear friend inside and out of the kitchen. Those sweet Mexican breads with their pastel-colored sugar coating are always so tempting. I’m a little girl again in a candy store – or a panadería, in this case – every time I walk by them. Yes, their allure has seduced me enough to scurry home and create them just the way I like, knowing they’ll be even better when freshly baked and still warm from my oven. 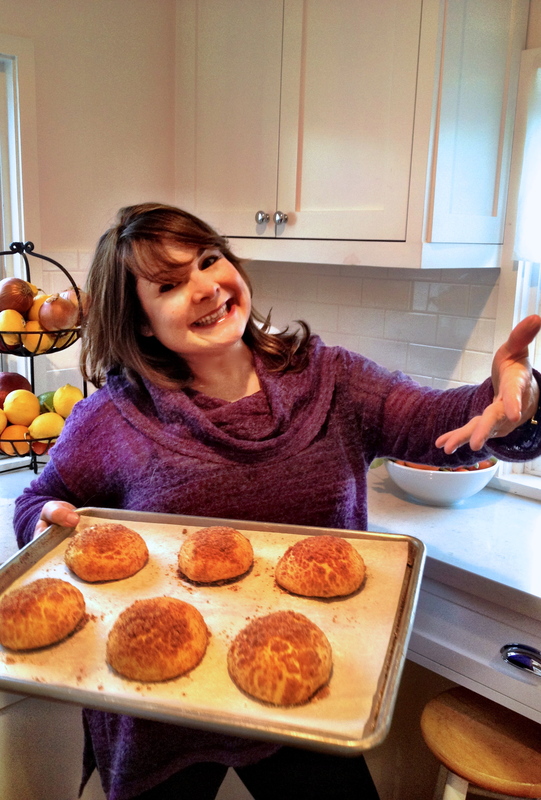 Mine are made with butter and bit of orange zest, and since I love cinnamon, I’ve given my little sweet buns a generous dose. They’re soft, tender and, might I say, perfect, just as I’ve imagined. To make the dough: Stir the warm milk and yeast in a liquid measuring cup and let stand until the yeast dissolves, about 10 minutes. In the bowl of a stand mixer fitted with the paddle attachment, mix the flour, sugar, and salt to blend. Add the eggs, egg yolk, orange zest, and yeast mixture, and beat on medium-low speed until the dough is smooth and elastic, about 2 minutes (the dough will resemble a very thick batter). With the machine running, gradually add the butter, beating until well blended. Refrigerate the dough until it is firm, at least 1 1/2 hours and up to 1 day. Chilling the dough firms up the dough, making it easy to roll out. Meanwhile, make the topping: Using your fingers, mix the sugar, flour, 2 tablespoons of the butter, cinnamon, and salt in a small bowl until small crumbs form. Line 2 heavy large baking sheets with parchment paper. Using floured hands, transfer the dough to a floured work surface and knead a few times. Divide the dough into 12 equal pieces and roll the dough into balls. 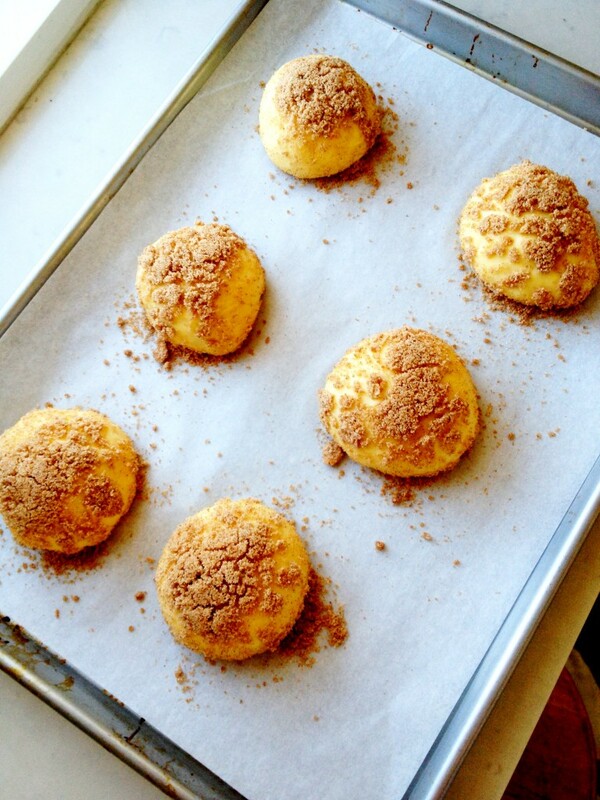 Roll each in the melted butter then roll them in the cinnamon topping to coat generously. Transfer the dough balls to the baking sheet, spacing them evenly. 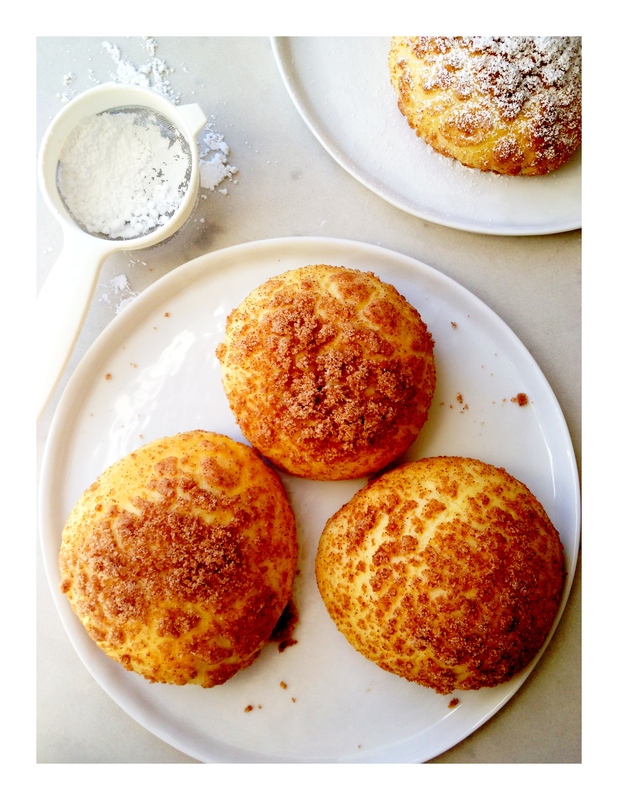 Gently pat dough the dough balls and sprinkle with more cinnamon topping. Cover with plastic wrap and let the dough balls rise in a warm, draft-free area until doubled in size, about 1½ hours. Preheat the oven to 400°F. Bake the breads until they are golden brown, about 7 minutes. Dust with powdered sugar, if desired, and serve warm.